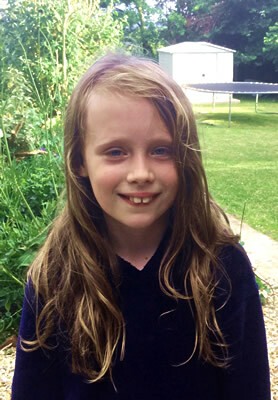 Tempest Hearne is a 10 year old pupil at Templecombe Primary School. She is currently trying to get as much sponsorship money for Kate Freeman’s brainchild "Winky Kicks Cancer", which rallies the Wincanton community to raise money for cancer research. On Monday 6th July, Tempest is going to have a drastic haircut at Wincanton hairdressers Scissor Happy and lose her lovely locks. Then she is going to donate 10 inches of her hair to The "Little Princess Trust", another cancer charity which uses hair donations to make wigs for children suffering hair loss through cancer treatment. “Tempest wanted to do something to help with Kate's charity and just came out with the idea of a sponsored hair cut a couple of months ago. Then recently another girl at school had a haircut and donated her hair to make a wig. Tempest got very excited and wanted hers to go for a wig too. If you would like to sponsor Tempest, please email Kirsten Hearne at . Kate Freeman, the founder of Winky Kicks Cancer, set it up in 2014 after going through breast cancer herself in 2013. “After finishing all my treatment I wanted to do something to help others battling this disease. I also lost my father to cancer in 2011 so cancer really has been a big part of my life. “Thanks to some wonderful people who wanted to get involved, we planned a week-long event of various activities around the pubs in Wincanton and raised an incredible £10,500. “We're doing it as an annual event and this year it will be 3rd August to 9th. Lots more things going on and fantastic people like Tempest getting involved, cutting their hair off for the charity. “We have a Facebook page and also a web page, www.winkykickscancer.co.uk that list all the activities taking place.